Note: This review was suggested my multiple readers, all of whom I know in real life. I don’t know how to feel about this. Another Note: To any readers stumbling across this site for the first time who may have the urge to write angry comments or type hate mail into the contact form using insults to anything along the lines of me being a sad communistic atheist who went into this film knowing he would hate it, I should tell you that none of that is true. I’m not angry. I’m disappointed. God’s Not Dead is a movie that could have been quite good, where two opposing forces debate their beliefs with equal mighty fervor and challenge audiences on both sides, but it is not. It is sometimes promising, but more often dull, occasionally excruciating, and once in a while morally reprehensible. And it’s also incredibly thinly written. But yet it was successful. Why? 2014 has been quite a banner year for widely accessible American films with a Christian viewpoint, a usually underrepresented demographic of filmmaking. And, regardless of its quality as a piece of art, many viewers have endlessly promoted them all. I’m going to only half-jokingly coin a term encompassing reactions described by, among other people, a film critic named Alonso Duralde on a podcast. Many have said it, but how can we make it one phrase? I’ll try: Underrepresentation Appraisal Bias. A fourth studio executive runs into the room. Studio Executive 4 writes a number on a piece of paper. The blood runs out of Studio Executive 2’s face. In the spirit of full disclosure, let me start by saying I am a pastor. 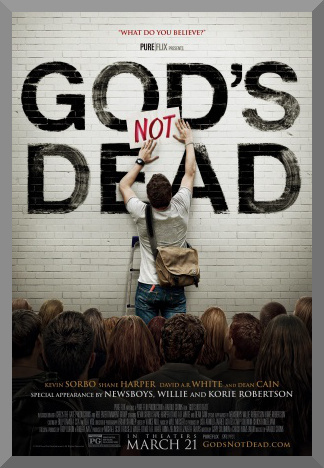 So here’s my problem with “God’s Not Dead.” It’s very… well pretty much everything you said. I wanted it to work I really did. I think it has a good message at its core, and it works OK as a youth-centric Christian film, you know, like something you’d show to a Christian youth group. By the way, we’re screening it at one of my churches. For youth. It raises some good points, though. College is a place where shallow Christianity goes to die. I know, I work at one, I attended a few, the postmodern worldview is incessant and beats Christianity like a bad puppy that peed on the carpet. So the whole angry philosophy professor, I believe it. I’ve seen it up close. I know his real name. He works here. BUT… where I draw the line is (spoiler alert) Nah I’m not going there but you know what I’m talking about, the climactic scene where all the loose ends are tied together in a big bow just in time for Christmas. It was too, tidy. Too neat. Too unrealistic. I have seen some major, and I mean major conversions in my day. Heck, I’ve been one. But… no. Anyway, I wanted to love this film. I think it’s OK as an after school special, not as a feature film. But it’s pretty much stock and trade with what a lot of Christian-themed production companies are churning out these days. According to the latest census, 85% of the U.S. population claims to be Christian. If only half of those people go see a movie out of, I don’t know, church guilt or something, that’s still a staggering 125 million people. I know that nowhere near that many went to see this one, but that’s what these execs think. And they make movies to make money so they can make more movies in the same vein. Self-sustaining mass-evangelism, if you will. But overall I think your review is completely fair. The last 15 minutes of this movie nearly constantly verge on the line of self-parody.